The VASYLI + Dananberg orthotic is a great all round, orthotic that is used to support the biomechanics of the feet for people who are suffering from injuries and issues related to how their feet work. In particular when they are walking and running. The Orthotic can assist with issues such as plantar fascitis, heel pain, arthritic pain in the toes and calf issues that are related to running. The top of the orthotic has a nice comfortable felt layer, which allows the foot to sit comfortably without slipping and sliding when you are wearing socks. Heel support in the back has a built in cushion, which allows the orthotic to support the heel position whilst also providing cushioning underneath your heel. The medial arch support corrects the overpronating or flat foot position, that many people have when standing, this also occurs when many people walk. It is very important for conditions that are made worse by running or walking. Fitting the orthotic correctly requires some assistance from a health professional to get the correct size and to make adjustments where necessary, tailoring the orthotic to your foot. Furthermore, an orthotic alone rarely corrects all of a clients foot problems and is usually given in association with specific exercises that are tailored to your problem. Exercises such as self joint mobilisation techniques, soft tissue stretching, proprioceptive retraining, and muscle retraining are commonly given in conjunction with an orthotic to provide the best result. In our vlog Scott fits Nick with the Vasyli Orthotic. 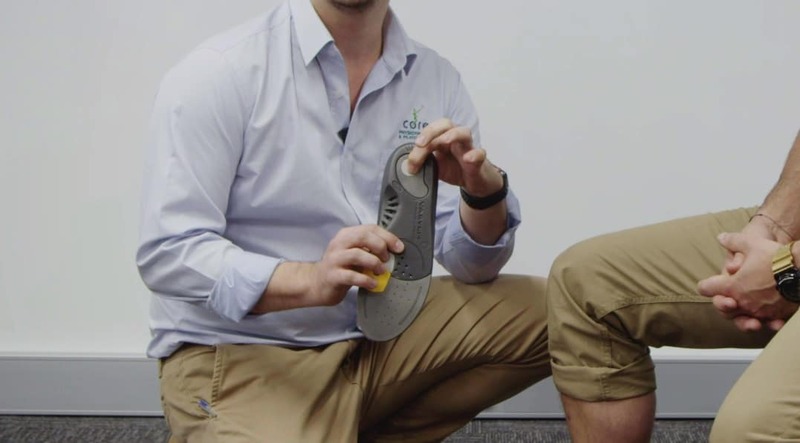 If you’re somebody who does need orthotics, or you think that you may have an issue that requires assessment then book an appointment with one of the Physios at Core Physiotherapy and Pilates Studio, they’ll be happy to help you out.